All washer-related services are important. From how efficiently they are fixed to whether or not washers are installed correctly, the service will make a difference to the appliance’s operation. For any service and professional work, trust our washing machine technician in Canoga Park, California. We provide local service and have the skills to cover all needs. From installing a new washing machine to fixing or maintaining the existing one, Appliance Repair Canoga Park is the company to depend on. Why call our washing machine technician to fix the appliance? Each washing machine technician on our team is knowledgeable, certified, insured, and licensed. We have the know-how and expected experience to identify washer problems and fix them. Whether you have a combo washer & dryer or a top/front load washer, our pros can repair it. Our pros come fully prepared to troubleshoot washer issues and replace the damaged appliance parts. No matter what the issue with the washer is, we come quickly to sort it out. 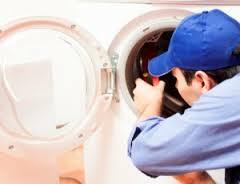 Call us now if you want fast washing machine repair in Canoga Park. No matter which model you own, our pros can handle its problems. We always bring the right spares for your washer and make the necessary replacements on the spot. Is the washer not starting, spinning, or draining? Trouble latching it? Does it leak? Regardless of the problem, our washer tech comes as soon as possible to repair the appliance. Rely on our washer installation skills too. Let us install the new washer – combo or not. We level it and make sure all connections are done correctly. Our techs have the experience to install all washing machines and always respect their specs. You can depend on our preventive washer service to get hassle-free operation. Washers need maintenance. And we provide it. Irrespective of make & model and whether your washer is a high-end appliance or not, washing machine parts wear and might even corrode over time. With our regular inspections and service, we keep them from causing trouble. Our Canoga Park washing machine technician is here to offer professional services on time and effectively. We have friendly prices and an honest approach to ensure the best customer service. Call us if you need to service your washer today.